Kidney function is essential to sustain life. If your kidneys are showing signs of disease, your doctor and nurse will discuss options with you. 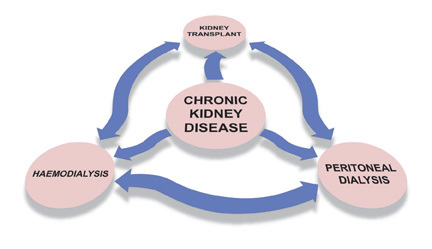 Conservative Management of Kidney Disease. In general, if at all possible, your doctors and nurses will discuss these options many months or years before you actually need them, as planning your treatment can make your journey much simpler. Remember knowledge is power; the more information you have, the more able you are to make a decision about the best form of treatment suitable for you. Dialysis is a process in which your blood is filtered to remove waste products and excess fluid which build up because your kidneys are not working properly. 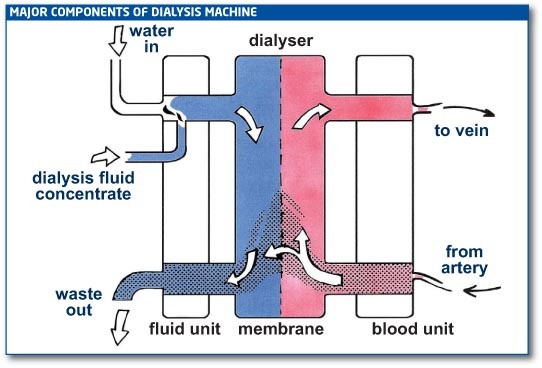 Dialysis uses a filter (membrane) and a special solution (dialysate) to remove the fluid and waste. Here comes the science bit. Dialysis is essentially an exchange, within the body of fluids and chemicals, made up of the normal waste products our bodies produce. The two ways that the body can do this are called Diffusion and Ultrafiltration. Dialysis aims to mimic these. Diffusion is the process which removes the waste products from your blood. Chemicals will move across a semi-permeable membrane from where they are in high concentration to an area in which they are in low concentration. In your case, chemicals are in high concentration in your blood and in low concentration in the dialysate fluid. The semipermeable membrane is either the dialyser (Haemodialysis) or your peritoneum (Peritoneal Dialysis). Ultrafiltration is the removal of water from the blood. Ultrafiltration requires an extra force in order to remove the fluid. In the case of Peritoneal Dialysis, the glucose in the dialysate provides the extra force. 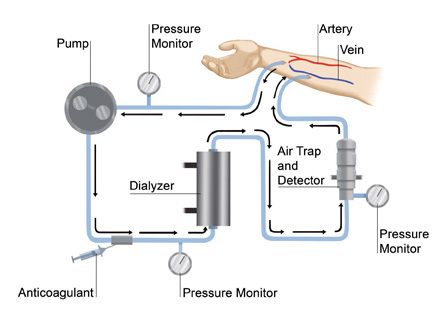 The haemodialysis machine is programmed to provide the extra force.